Home Health Awareness Why Is Folic Acid Essential To The Mind And Body? Why Is Folic Acid Essential To The Mind And Body? Folic acid is important for our health in so many ways. Also known as vitamin B9 or folate, it aids in the creation and repair of DNA, boosts proper brain function, and helps in the production of red blood cells. 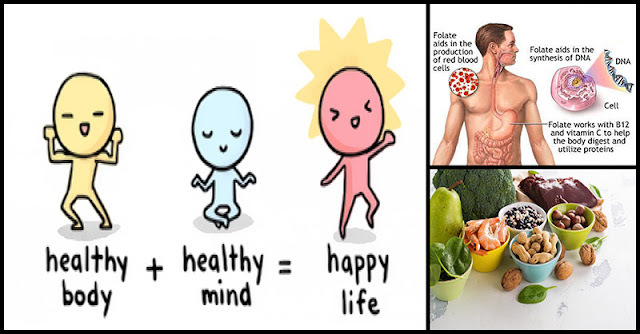 It is a water-soluble vitamin that’s why you need to supply your body with this vitamin on a daily basis because the body cannot store unused amounts of folate. Fortunately, there are an array of natural sources of folate. Numerous vegetables, as well as fruits, contain an abundant amount of this vitamin. There are also food products that are fortified with it such as grains and bread but we always recommend to get your nutrition from natural sources. Not getting enough of this nutrient may lead to several health issues such as fatigue, forgetfulness, loss of appetite, weakness, and unwanted weight loss. In severe cases, anemia may develop to those with impaired kidney function and alcoholics. Pregnant women are more prone to folic acid deficiency. Doctors say that pregnant women should supplement themselves with folic acid particularly if they are not getting enough of it from their diet to prevent birth defects. Not only women can benefit from this vitamin. Men also need this vitamin for a number of reasons. Let's read on and see what this vitamin can do to your health. Folic acid works with vitamin B12 to prevent the occurrence of blood clots, thus reducing your risk of having cardiovascular diseases such as heart attack and stroke. It helps reduce the risk of developing cancer. Studies have shown that a deficiency in folic acid in the body is linked with certain types of cancer like stomach and colon cancer in particular. folic acid aids in treating depression. This vitamin makes you feel good all over because it can stabilize your mood. This nutrient can also prevent diabetes by reducing the levels of triglycerides in the blood. According to studies, high levels of triglycerides are present in people with diabetes. Folic acid helps protect the brain. It was found out in several studies that folic acid reduces the risk of developing Alzheimer’s Disease by as much as 50%. This vitamin also helps prevent memory loss related to aging. Considering these facts, it is no doubt that folic acid is essential in maintaining a healthy mind and body. Always see to it that your body gets enough amount of folate on a daily basis. As a reminder, this vitamin is water-soluble so excess amounts of this vitamin are flushed out of the body through urination that’s why it needs to be constantly supplied every day. Tropical fruits – Mangoes, papayas, bananas, kiwis, and avocados — all of them taste wonderful, and including them in your daily diet helps reduce your risk of being deficient in folic acid. Cruciferous vegetables – The regular consumption of broccoli and asparagus helps ensure that you are getting enough of folic acid. These cruciferous vegetables also help detoxify the body. Beans – Lima, mung, pinto, navy, black and kidney beans are packed with folic acid. They also supply your body with protein, vitamin C, iron, manganese, magnesium, phosphorous and calcium. Dark green leafy vegetables – You can get high amounts of folic acid from the likes of spinach, collard greens, lettuce, and arugula. These vegetables are also excellent sources of fiber and other vitamins and minerals. Egg yolks – Other fantastic sources of folic acid are egg yolks. However, you should limit your consumption of it because it is also rich in saturated fats and cholesterol. Oranges – Something as simple as eating oranges or drinking orange juice ensures that your body is supplied with folic acid. Oranges are also packed with vitamin C that’s good for the skin, teeth, bones, and immunity.